Eventually there comes a time for everyone where they are planning to image a target and realise that it does not fit into the frame, or they would like to capture something adjacent to it as well, together into one image. One could at times use a shorter focal length telescope, or a larger camera sensor, to frame your target(s) appropriately, but this cannot always be done. Moreover, one may wish to take advantage of longer focal lengths to end up with a higher resolution image. Inevitably, we end up having to create a mosaic. Mosaics essentially involve capturing exposures of two or more adjacent areas of the night sky, pre-processing each of these images and then joining them up into a single, large image. Further post-processing is then carried out on this joined-up image. 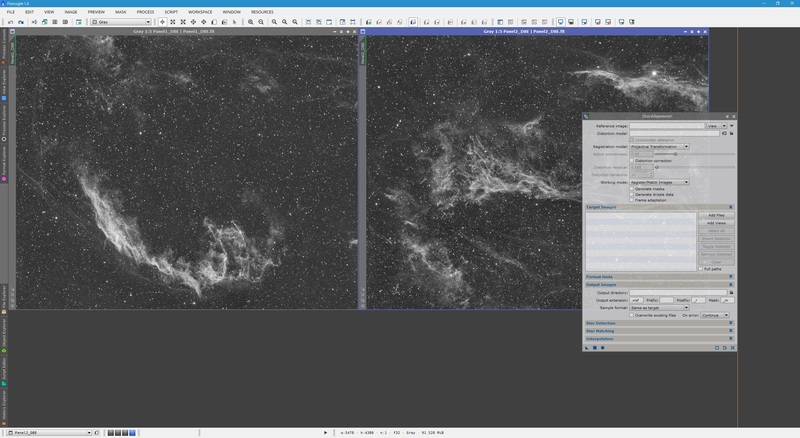 This tutorial aims to fill in the gap between pre-processing each image individually and further post-processing of the joined-up image by describing, in detail, the procedure by which we use PixInsight to join up images into a mosaic. Given that this tutorial fills in that gap alone, it is requested that the user pay close attention to the following assumed list, as there are a couple of things that should be done to each image involved in your mosaic prior to starting this tutorial. Also note is that this tutorial works equally well for monochrome and colour images. Finally, I would like to mention that this tutorial by David Ault for mosaic construction in PixInsight is a fantastic read and in particular, he includes his own DNALinearFit script that does a better job than PixInsight's own LinearFit process when you have issues matching the background of your individual mosaic images. Also, the technique described here about deleting pinched stars is in credit to him. Your images have all had the black edges resulting from pre-processing removed using DynamicCrop ​and any background gradients present removed using DynamicBackgroundExtraction (read this, sections 2 and 3). We start with the images that we will be making into a mosaic. As per the assumed list at the top, these have both been fully pre-processed. Although it is not important at this stage that we remove any black edges resulting from the stacking process, DynamicBackgroundExtraction does work best when there are no black edges in the images. Therefore, black edges resulting from pre-processing were removed with DynamicCrop followed by removal of all background gradients using DynamicBackgroundExtraction. The following are the images. They are still linear but have been autostretched in PixInsight for demonstration purposes. 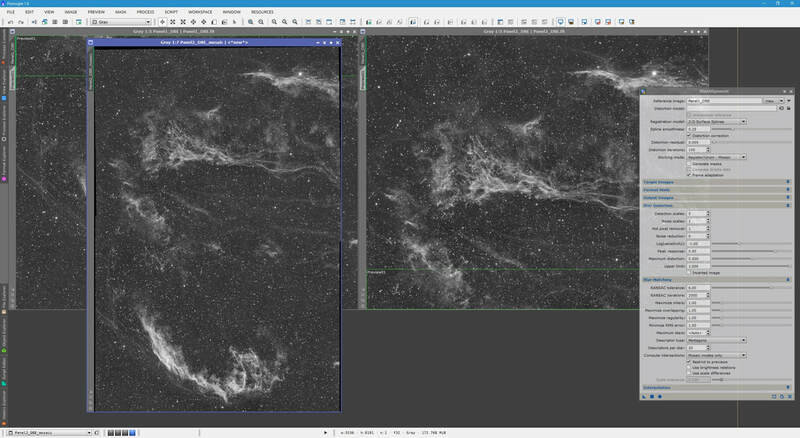 The above images are of the Veil Nebula. The left image is supposed to go below the right image. There is some clear overlap between the two, which corresponds to the top of the left image and the bottom of the right image. The overlap is about 15%, as per my imaging plan on Sequence Generator Pro​. You may wonder why it is we want to create a rough mosaic when we could just create a great mosaic. What we are going to do is join up the images quickly into a mosaic, but inevitably that mosaic may have seams where the individual images merge. 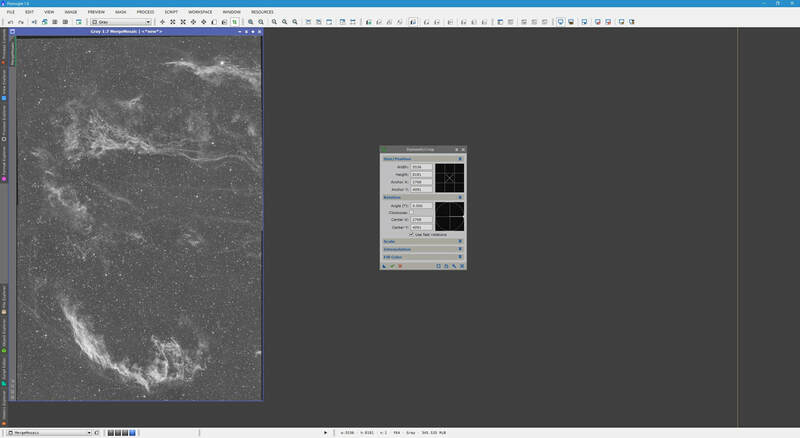 We will use this rough mosaic to prepare our individual images so that another process actually creates a seamless mosaic. ​We do however require this rough mosaic as a reference. This is particularly the case when you have more than two images to create your mosaic. ​Let us start by opening the StarAlignment process. We will now select a reference image. I will use my first image (the one on the left). There is no reason to choose one over the other at this point, since we just starting off. 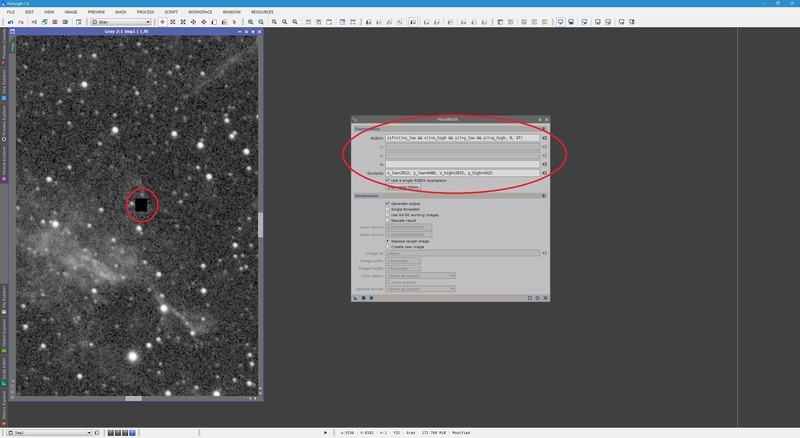 Simply click the button next to Reference image at the top of ​StarAlignment, select one of your images from the list and click OK.
For best performance in mosaic construction, we select 2-D Surface Splines under Registration model. We also enable Distortion correction and increase Distortion iterations to about 100. Increasing Distortion iterations from its default value of 20 ​helps with difficult cases where star matching is not adequate, so you may not need to alter this value at all. Under Working mode, we select Register/Union - Mosaic and enable Frame adaptation​. Distortion correction tries to compensate for any distortions introduced by matching the images when there is a slight rotation between them (which is common). Frame adaptation is important as it attempts to match the overall brightness of the images as it merges them, which gives a more even background that minimises seams. 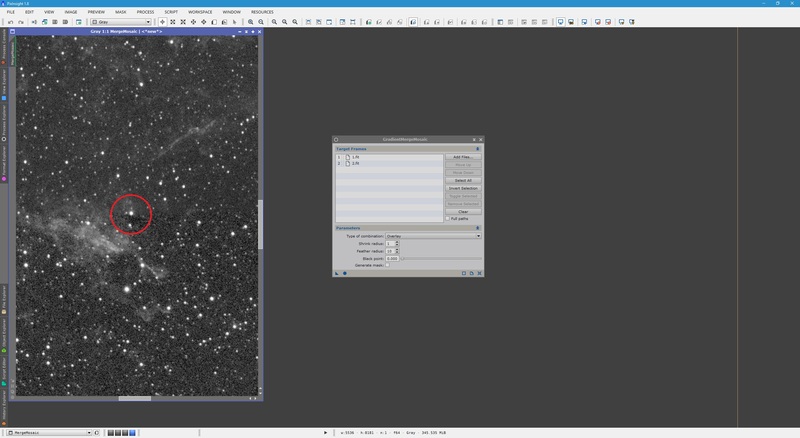 We will now tweak some star detection parameters to optimise the matching of images for the mosaic construction. For this, we expand the Star Detection tab. Since the images are still linear and have not had any noise reduction applied, there will be a fair amount of small scale noise. 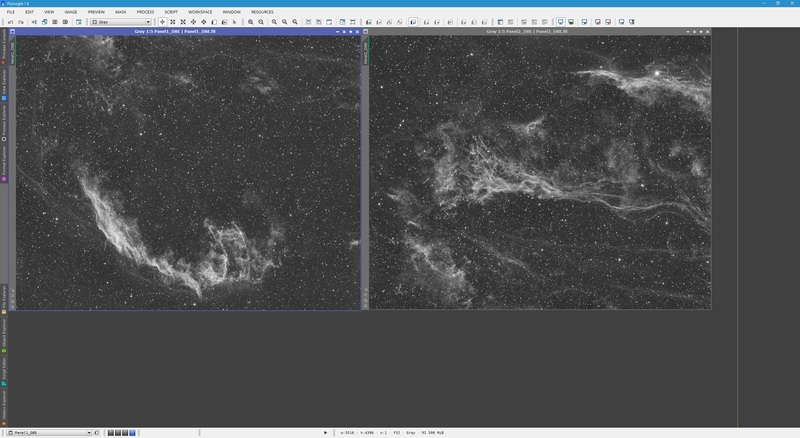 Since this lives mostly in the first wavelet layer (smallest pixel scale), we can increase Noise scales to 1 so that the first wavelet layer is ignored when it comes to star detection. Please note that this is not a requirement unless star matching for mosaic construction is an issue, so do not bother setting it if there are no problems. If there are any such problems, setting this could help with appropriate star matching. We now expand the Star Matching tab. 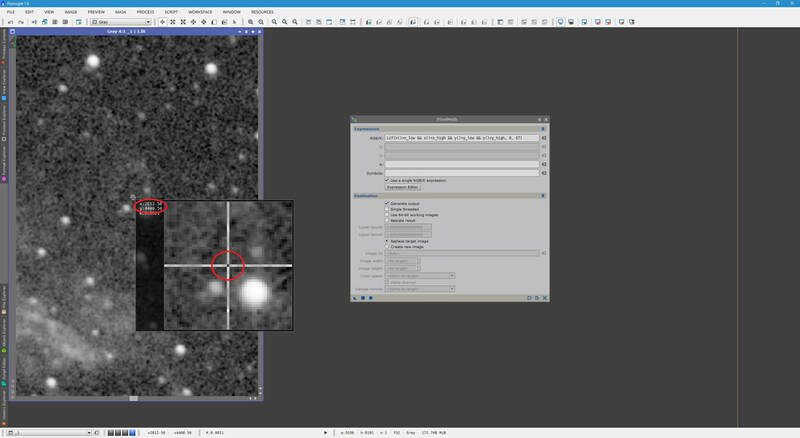 To loosen the star detection parameters so more stars are picked up easily, we increase RANSAC Tolerance to 6.00 (although you can increase this to its maximum of 8.00 as well). 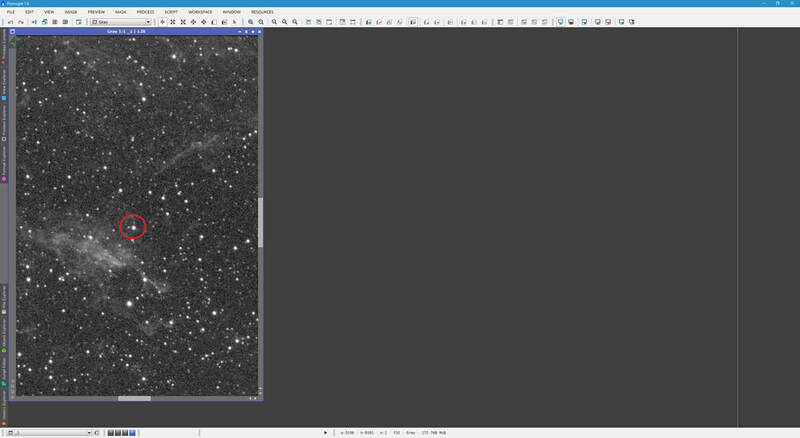 If the mosaic merging fails due to lack of star detection, you can certainly try a value of 8.00 here, together with a larger value for RANSAC Iterations (say 3000 or 4000). Make sure the Restrict to previews option is enabled, as we will tell StarAlignment roughly where the images merge. 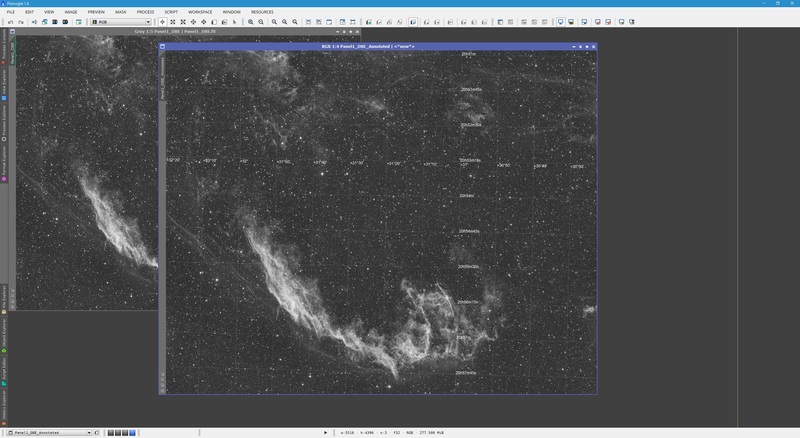 We can now lend StarAlignment a hand into knowing where both images merge. For this, we create preview boxes in both images, encompassing more or less the area that overlaps between both. You need not be 100% accurate by any means - just a more or less​ preview box on both will do, as shown below. Please note once again that this helps with difficult cases of star matching. In most cases, you will not need to bother creating preview boxes as StarAlignment​ will do its job perfectly well without them. We are now ready to Apply the StarAlignment process. Since the left image is my reference image, I need to apply the process to the right image (the target). This will merge the second image over the first image. Doing this produces a new image after some processing. ​That already looks pretty good, but there are some seams visible if we zoom in. Regardless, there is another process that does a better job of merging images together into a mosaic. We just needed this result to work with that. 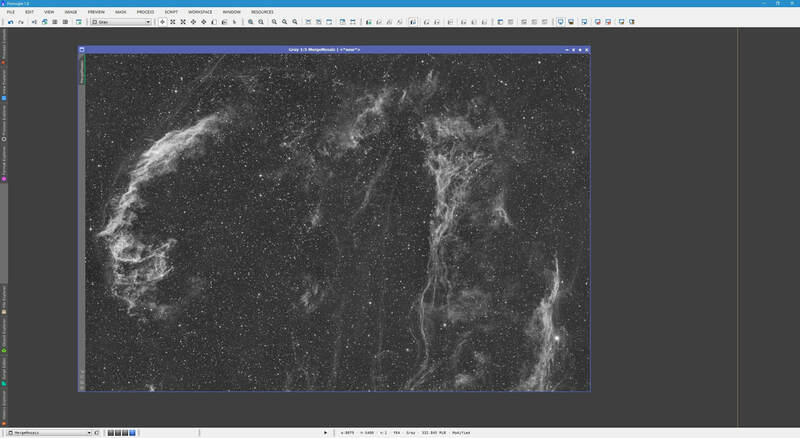 With the rough mosaic prepared and open in PixInsight ​(alongside our individual images), we now set the rough mosaic​ image as the reference image in StarAlignment​. We can leave all the settings intact, but we need to change the Working mode to Register/Union - Separate. What we have to do now is simply Apply the StarAlignment process to each one of our individual images, one by one. Each time you do, two new images will come up. Autostretched, one is basically the same individual image as before but placed in a larger image (the same size as the rough mosaic), with black filling the area that is not occupied by that individual image. The other is like the rough mosaic - you may close this one. You need to save the individual images that appear with black filling as new files as the next process we will use needs actual files to work with. I saved mine simply as 1.fit and 2.fit ​in the same folder as the rest. 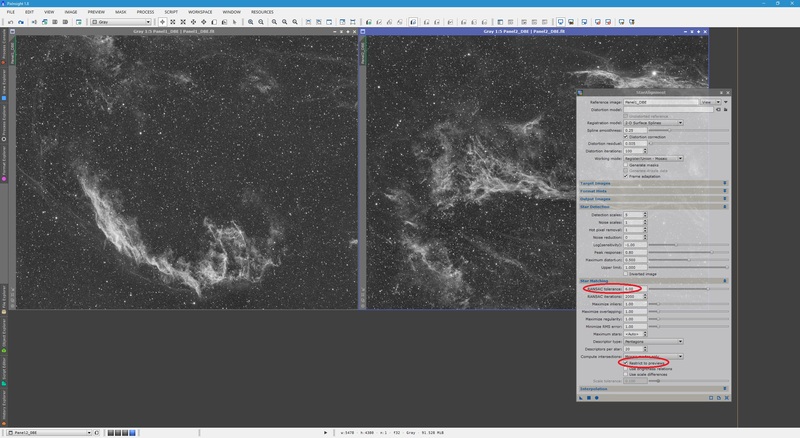 ​​At this point, having registered all our individual images with the rough mosaic, we can close every image that is open and close the StarAlignment process as well. If you saved your rough mosaic​ image as a file, you can delete it as well as we no longer need it. At this point we have covered a general case of mosaic construction - one that will work equally well for two segments as it will for the likes of sixteen segments. This involves creating a rough mosaic to act as a basis to prepare your individual segments in the same size as your full mosaic. However, if your mosaic only has two segments, there is no reason to create the rough mosaic at all. You could simply set up StarAlignment as in section 1, but with Working mode set to Register/Union - Separate, applying it to the segment that is not acting as reference. 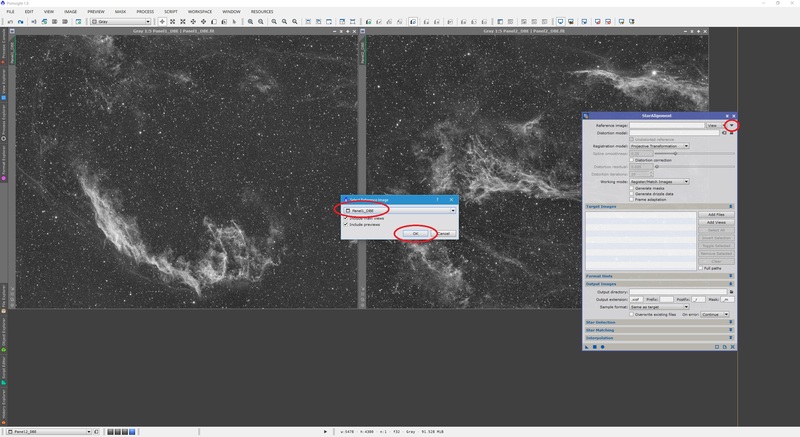 This will automatically generate two new images - both mosaic segments prepared in the same size as your full mosaic. You can then save these and continue to section 4 below. In other words, you are skipping the rough mosaic step altogether, because you do not need it when there are only two segments involved. Please note this tip as it will no doubt save you time and effort when working with two segment mosaics. ​​So far we have gone through the method of preparing the individual mosaic segments for merging with GradientMergeMosaic, covered below in section 4. This method involved creating a rough mosaic in order to register each individual mosaic segment separately. 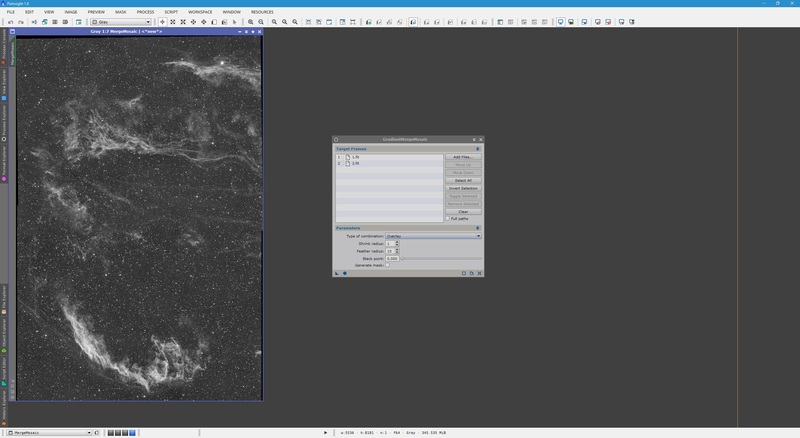 It was also discussed that if your mosaic consists of only two segments, that you may skip the step on producing a rough mosaic reference and simply register each mosaic segment image with each other. In this section however, we present an alternative method to preparing one's mosaic segment images for later use in GradientMergeMosaic (described below in section 4​). 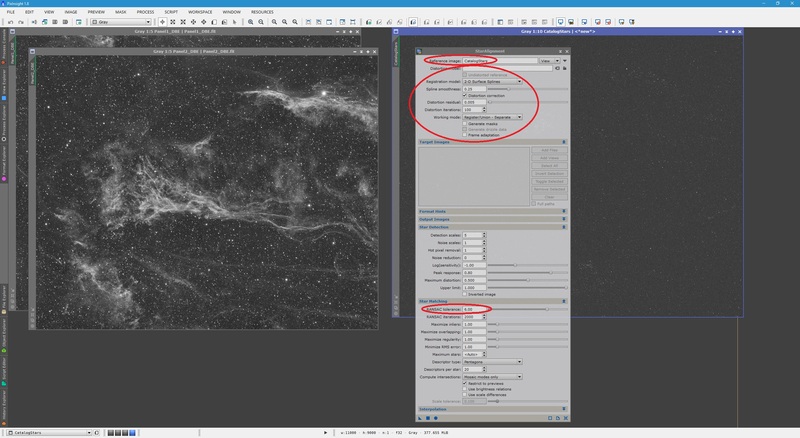 This method is recommended by Juan Conejero of the PixInsight team, and is covered by David Ault in his tutorial. This method is recommended particularly for mosaics consisting of more than two segments, due to the fact that it prevents us performing two registration procedures (one for the rough mosaic and another for the individual mosaic segments with the rough mosaic​). As a result, the overall distortions and inaccuracies introduced into the end result are minimised by virtue of reduced manipulation​. 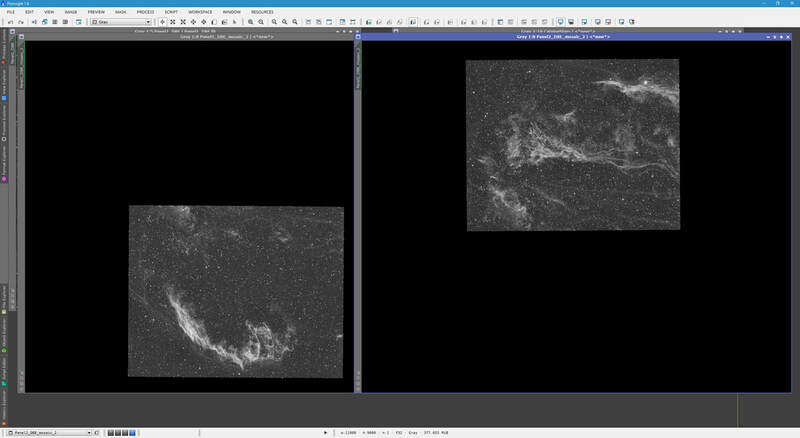 ​We begin again, with both mosaic segment images open in PixInsight, autostretched for demonstration purposes. These have been fully pre-processed, have had their black edges cropped out and have been treated with DynamicBackgroundExtraction to remove any background gradients. 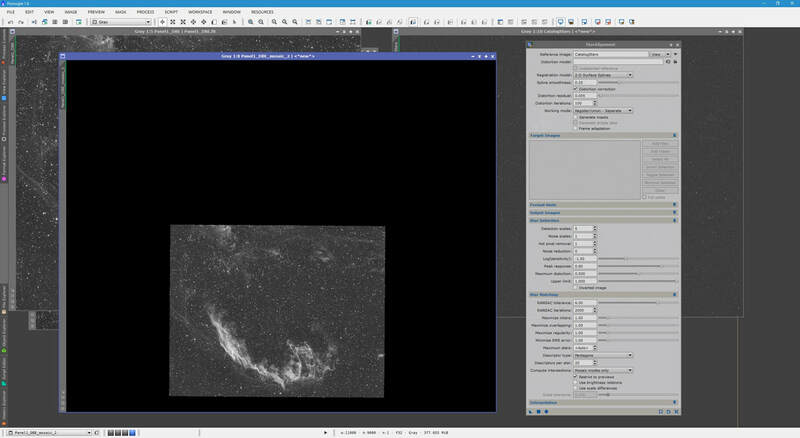 ​​The method we are about to go through involves creating a fake image of just the stars around the region of the night sky relevant to the mosaic segment images. This can act as our rough mosaic did earlier, to allow the individual mosaic segment images to be registered with it. As a result of how this method is employed, it will work equivalently no matter how many segments your mosaic consists of. This tutorial covers the method used with two segments but it is the same for any arbitrary number of segments. ​We first need to determine the Right Ascension and Declination coordinates of the centre of the mosaic. It does not need to be exact, but a good estimate is key to preparing our fake stars ​image. I note that in my particular mosaic, the top of the left image (or the bottom of the right image) is the centre of the mosaic. It may help you to lay them out so you can determine where the centre lies. If your mosaic consists of an odd number of segments, then the centre of one of your mosaic segment images will effectively be the mosaic centre. Since my mosaic consists of two segments, I arbitrarily pick the left image to use to determine the centre of the mosaic. I therefore close the right image, as I do not need it just yet. ​​I would like to perform a plate solve on this image, which will give me a number of parameters, including the image's angle of rotation, its own coordinates, etc. This is done using the ImageSolver script, opened through the menu Script -> Image Analysis -> ImageSolver​. ​​Having Active window selected under Target Image is the correct option, as we only have the image that contains the centre of the mosaic open. If you have others open as well, you will need to click to select it first and then open the script. We now need to provide the script with coordinates for what our selected image contains. 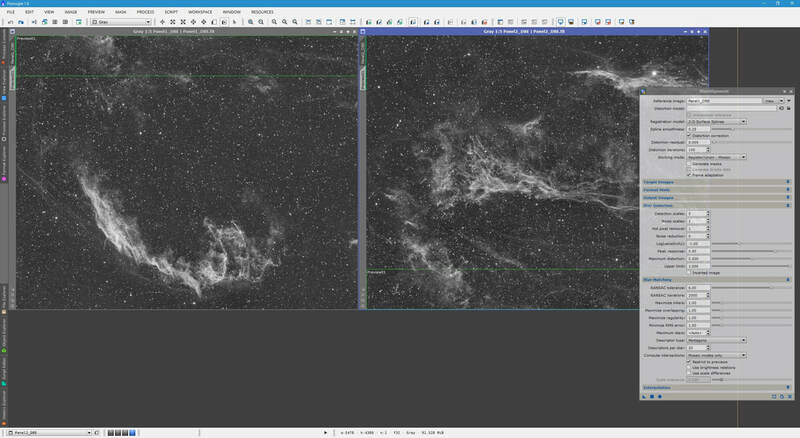 In my case, this contains the NGC6992 Eastern Veil Nebula. One can sometimes find Right Ascension and Declination coordinates through a multitude of sources - Wikipedia, Stellarium, Cartes du Ciel, Starry Night, etc. 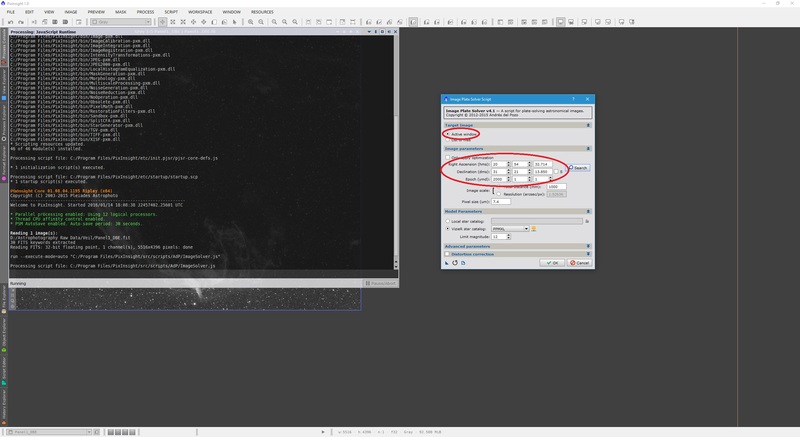 The trouble is that the coordinates entered should be contained within the image for the script to work. 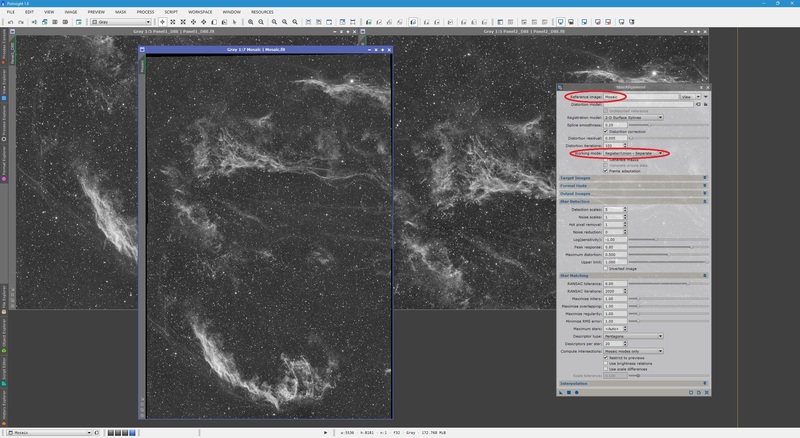 As a result, an object as large as the Veil Nebula can be awkward because the coordinates for the centre of the Veil Nebula are not contained within my selected image, for example. As a result, I need to look up coordinates for the NGC6992 Eastern Veil Nebula in particular, as that is clearly contained within the image. 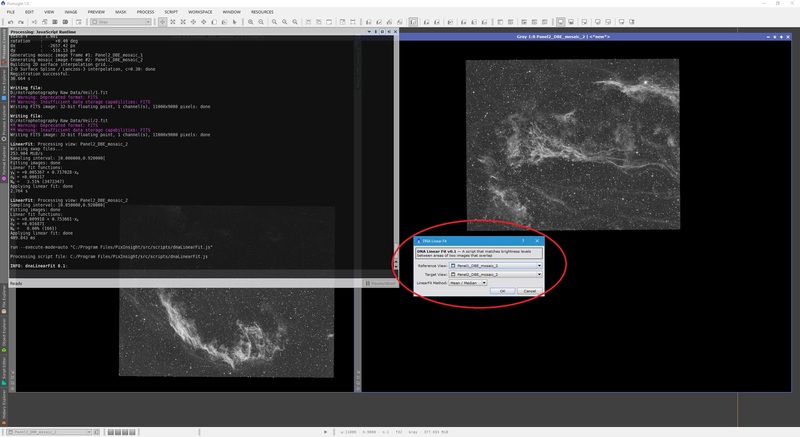 If you have trouble finding information, perhaps because your selected image does not contain anything of interest, then you should upload the image to Astrometry.net for blind plate solving. Please note that sometimes uploading a single raw exposure rather than your pre-processed image yields faster plate solving (or successful plate solving when your pre-processed image fails to be plate solved). Once the image is uploaded, it will be plate solved automatically. Once done, the page will report Success and you can go into the results page. On the right column of the results page you will find coordinates for the centre of your uploaded image. These can be entered into the script, with Epoch (ymd) left at default as it indicates the J2000​ epoch (if you did not get your coordinates from Astrometry.net, make sure the coordinates you have are J2000, of course, otherwise change the Epoch (ymd)​ setting accordingly). ​The S checkbox is left disabled, as this is only enabled when the Declination coordinates are meant to be negative, which applies to Southern Hemisphere targets. It is important to set the correct Pixel size and Focal distance or Resolution for the plate solver to do its job. Since this was imaged with a Sony ICX694 CCD sensor, the correct Pixel size for me is 4.54. The telescope used has a focal length of 368 mm, so this could be entered under Focal distance. However, there is an issue - this image is not in the original capture resolution. This image was Drizzled during its pre-processing procedure. A focal length of 368 mm with the Sony ICX694 CCD sensor yields a Resolution of 2.545 arcseconds/pixel. If I plate solve my pre-processed image however, the plate solve results tell me the Resolution is actually 1.272 arcseconds/pixel. That is half of the value predicted. This is because the Drizzle algorithm artificially increased the pixel size of the image by two, making it seem like double the Resolution. It is therefore important that I enter 1.272 into Resolution rather than 2.545, and that I avoid entering 368 under Focal distance. This way the script has the image's correct information. ​The default VizieR star catalog of PPMXL is good for all the cases I have tried this method with. Simply raise Limit magnitude to 15 to 20 to pick up more stars for plate solving with. I entered 15 in my case. 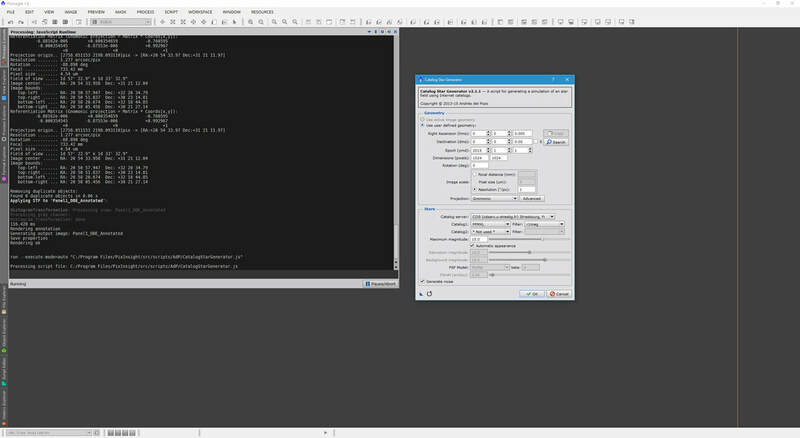 ​The ImageSolver script is now ready. Simply click OK and watch the Process Console as it will display status information. Once done, the results will be displayed there as well. ​We note that the Rotation picked up by plate solving is -88.898 degrees. This value will be used later when generating our fake stars image. 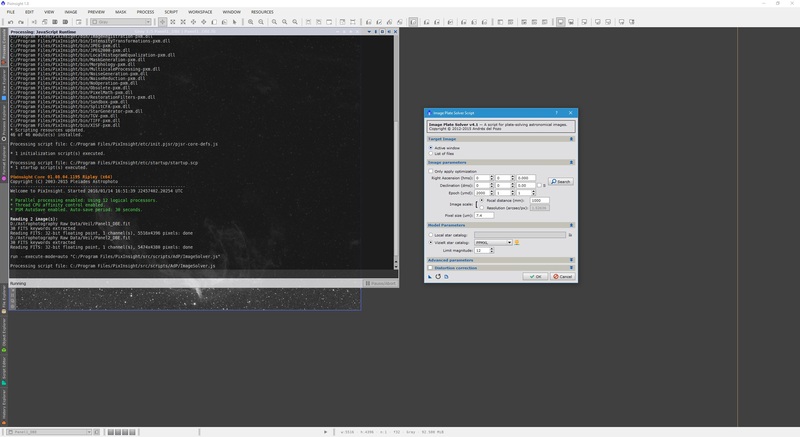 Indeed the correct value of Resolution is determined here as well, to be 1.277 arcseconds/pixel. This is noted for later use as well. Since I know that the mosaic centre is to the top of this image, knowing the coordinates of the centre of this particular mosaic segment image is of little use. We need to know, more or less, the coordinates of the centre of the entire mosaic. The script that will help with this is the AnnotateImage script, accessible through the menu Script -> Render -> AnnotateImage​. 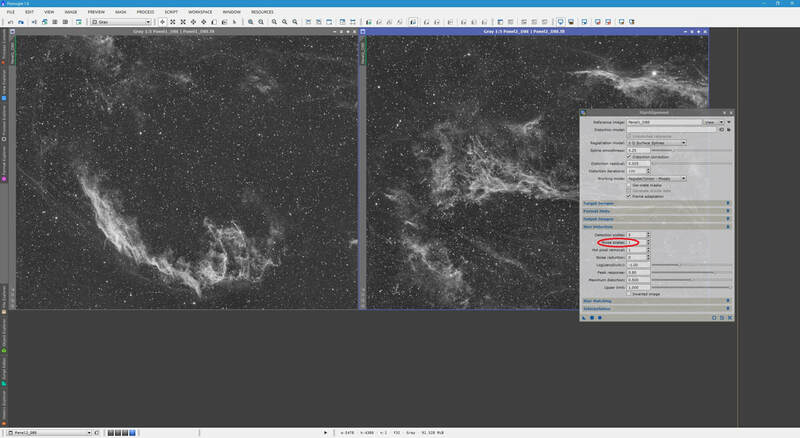 ​Under the Layers list, we only really need to enable Grid, as this will show us the Right Ascension and Declination coordinates grid superposed over our image. With only Grid enabled and selected from the Layers list, we set a larger Font size of 40. We also raise Grid density to about 10. Generally the rest of the settings at default work perfectly well, though you may want to alter the colour of the annotated grid. 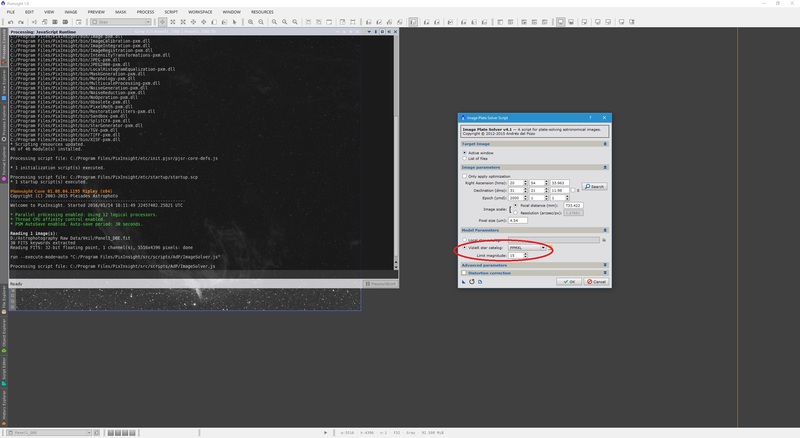 Before clicking OK, make sure the Epoch (ymd) setting matches what you used in the ImageSolver script. The default is J2000, which is correct for me. 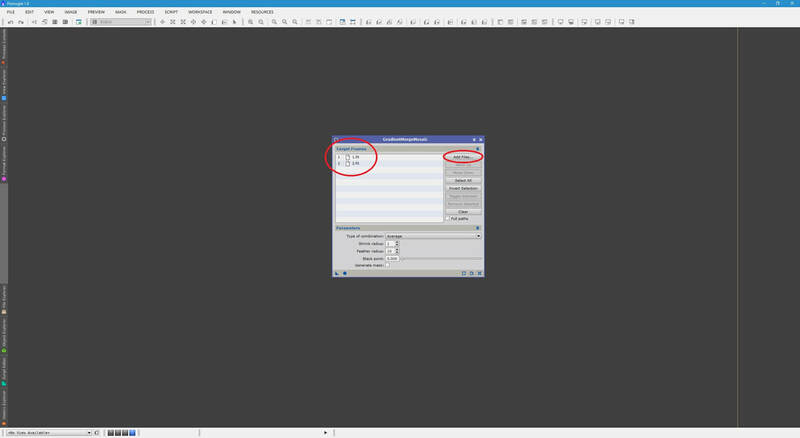 Clicking OK on the script annotates the coordinates grid over a clone copy of the image. ​We can now use the grid to determine more or less where the centre of the mosaic lies, given that I know that the top of this image is the centre of my mosaic. I determine this to be as circled and indicated below. ​This corresponds, more or less, to Right Ascension coordinates of 20h 51m 22.5s and Declination coordinates of +31° 20' 0.0"​. Together with the Resolution of 1.277 arcseconds/pixel and Rotation of -88.898 degrees, we have everything we need to produce an appropriate fake stars​ image for mosaic registration reference. All images open are now closed, and the CatalogStarGenerator script is opened, through the menu Script -> Render -> CatalogStarGenerator​. ​​Here, we enter the Right Ascension and Declination coordinates we found to be more or less the centre of the entire mosaic. We also make sure the Epoch (ymd) setting matches what we have been using thus far (J2000 in my case, so I enter 2000, 1 and 1). Again, the S checkbox is only enabled if your Declination coordinates are negative because it is a Southern Hemisphere target. In Rotation, we enter the angle determined earlier by the ImageSolver script. In my case, this was -88.898 degrees. 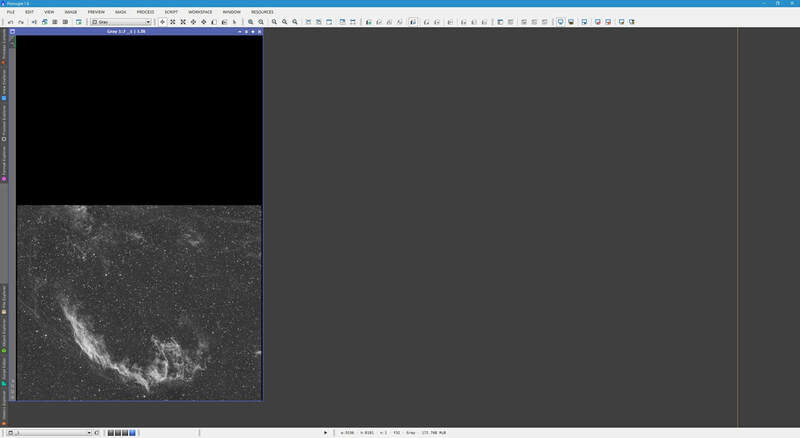 In Resolution under Image scale, we also enter what was determined earlier by the ImageSolver script. In my case, this was 1.277 arcseconds/pixel. We now need to determine how big the fake stars image should be in pixels. The default of 1024 x 1024 will most probably not suffice - it will certainly not in my case. My mosaic consists of two segments and each image has a size of about 5474 x 4380 (one is slightly, slightly smaller). Of course, there is an overlap of about 15% between them, but it is better to have more than to have less. Therefore, we ignore the overlap and simply add up all the dimensions of all our images. This will yield extra pixels but it is better to have more than to have less. I also round up my end result so it is further padded out. This gives me a total of 11000 x 9000 pixels. Again, these values are rounded up on purpose. In fact, since one of my segments lies above the other, I do not technically need to add the widths, but out of laziness you may exaggerate your values as I have. Feel free to be more calculated about it. Simply keep in mind that if you choose a value a little small, one mosaic segment image will be slightly bigger than the other and it will cause problems later when trying to merge them together. Therefore, always make sure you have extra pixels. 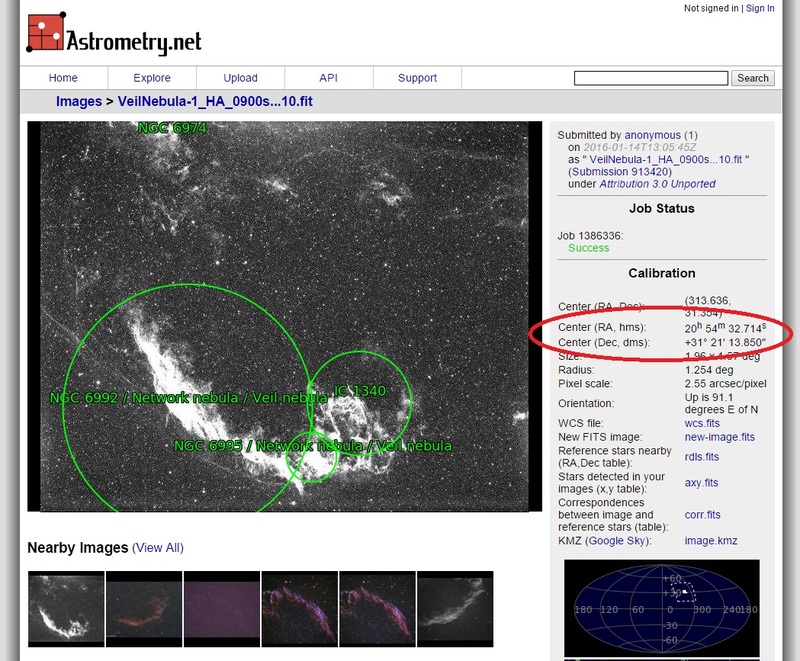 ​Under Stars, we can now select up to two different Catalogs. The default of PPMXL clearly worked well earlier so we can keep this. You may wish to select TYCHO-2 for Catalog2, just to add some more stars into the fake stars image. Set Maximum magnitude to what you set it earlier, 15 to 20. 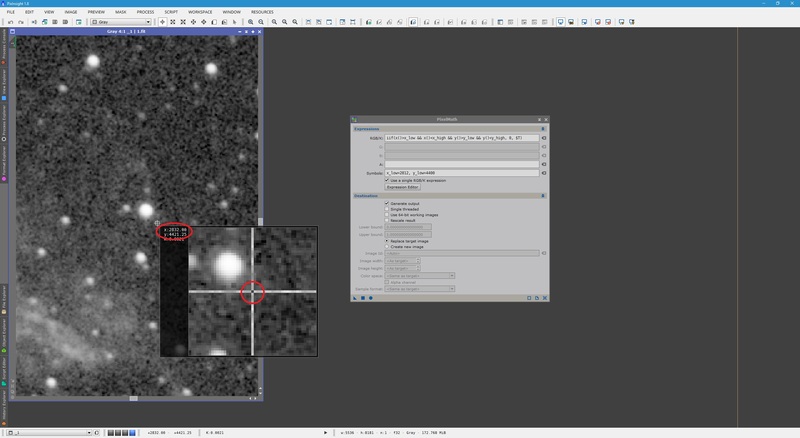 Once set, click the OK button and PixInsight will download and generate a fake stars​ image based on your parameters. The second screenshot below shows this image autostretched. ​This image is effectively our rough mosaic, with which we register all our mosaic segment images in preparation for merging later with GradientMergeMosaic​. 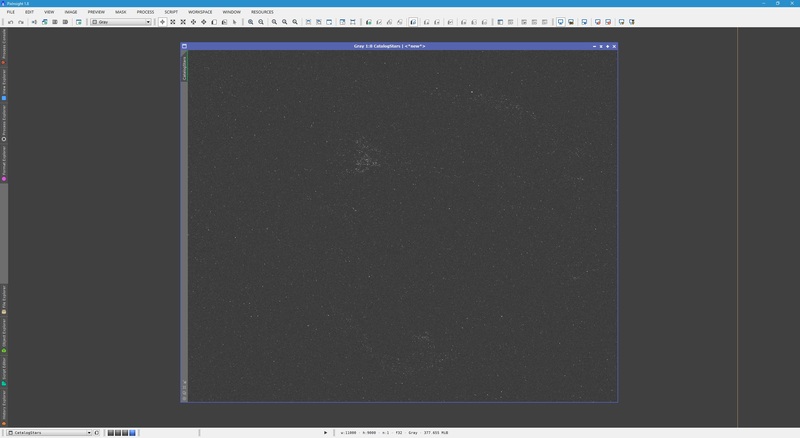 Therefore, we now open all our mosaic segment images as well as the StarAlignment​ process. The StarAlignment process is set up precisely as it was on section 2 above, with Register/Union - Separate set as Working mode. The Reference image is now set to the CatalogStars image that was generated. What we do not enable however, is Frame adaptation. This is an excellent setting to keep enabled but it depends on the Reference image being one of the mosaic segment images. 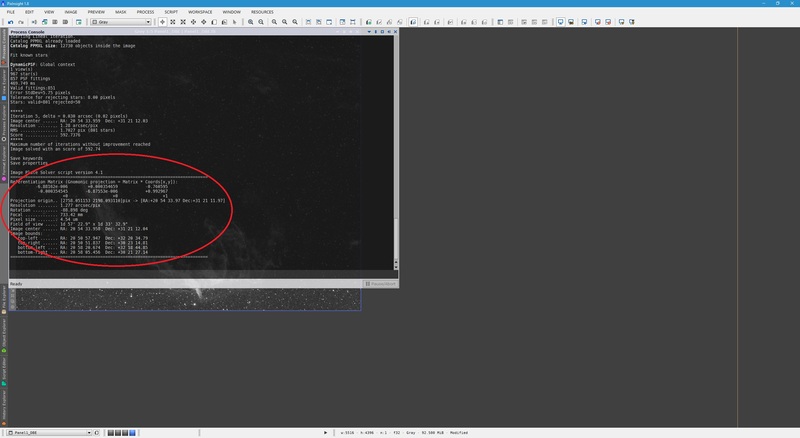 Since our Reference image this time is the fake stars image, we do not want to adapt the mosaic segment images to it. ​All we need to do now is Apply the StarAlignment process to each of our mosaic segment images, one by one. On each application, two images will pop up. One will be your CatalogStars image again, which you can close (do not close the original CatalogStars image however as you may need it for other mosaic segment images), and the other is your registered mosaic segment image. This one is shown below, autostretched. ​This is clearly correctly registered, and it lies within an oversized canvas with black filling. 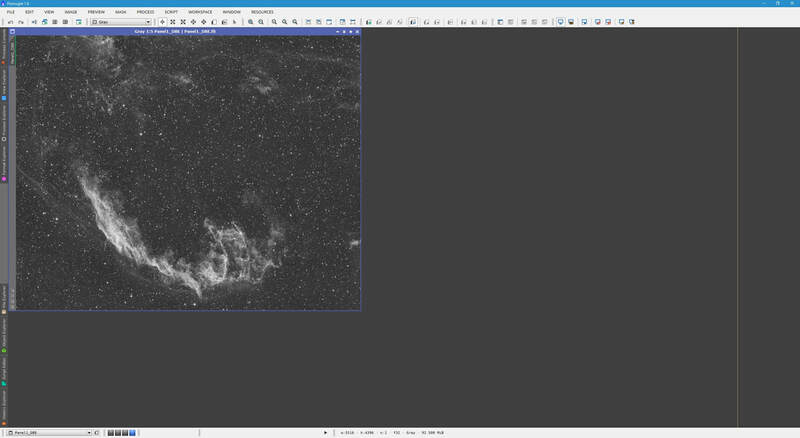 Clearly, as predicted, the 11000 x 9000 size for the CatalogStars image was an exaggeration. I could have done with less width as I did not need to add the widths of my images. Nevertheless, it has worked perfectly. Below shows both my mosaic segment images registered. 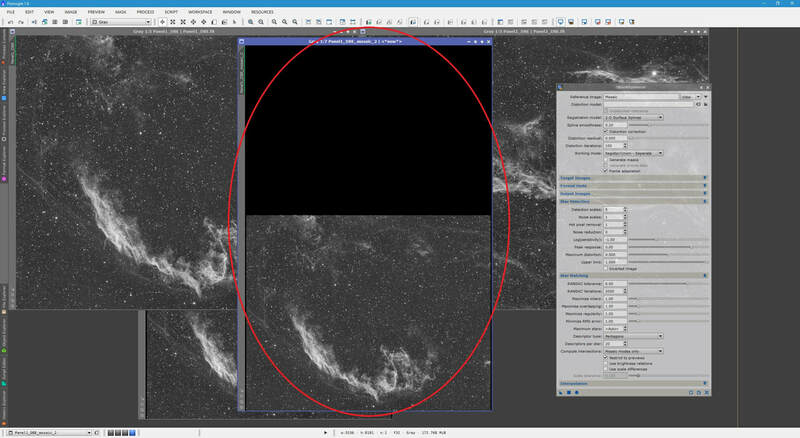 At this point, once all your mosaic segment images are registered and they all clearly fall within black filling, then it is clear your CatalogStars image was large enough. 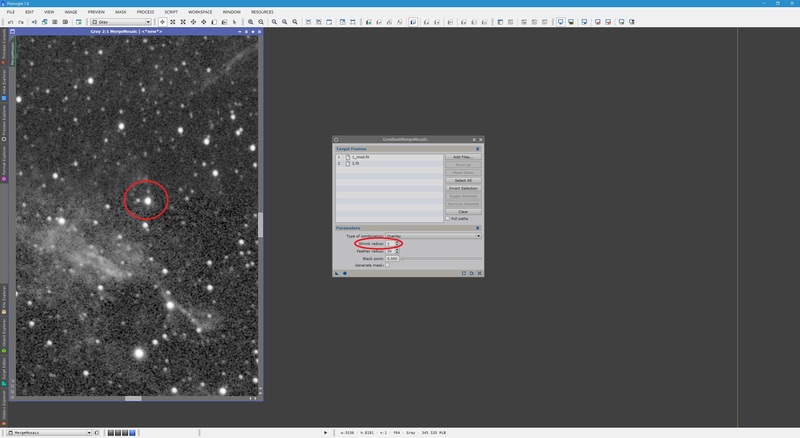 You can then close your original mosaic segment images as well as the CatalogStars image (without saving it). You should then save all your registered mosaic segment images as individual image files, for merging with GradientMergeMosaic, covered in the next section. 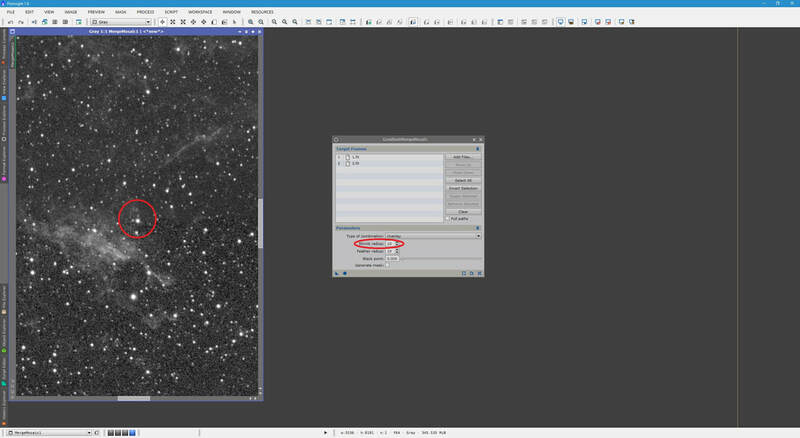 One issue you may encounter with this method of registering your individual mosaic segment images is that you have not been able to use Frame adaption in StarAlignment. As a result, the overall brightness of each image may not be well matched, even when merging them with GradientMergeMosaic. Unfortunately, the LinearFit process will not work with these registered mosaic segment images. This is where David Ault's efforts come in handy. In David Ault's tutorial, scroll down to the Intensity Matching section and download his script, called DNALinearFit​. 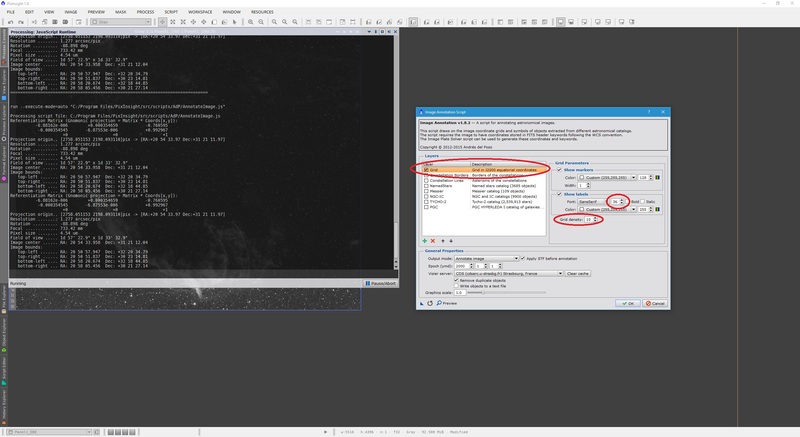 You will need to add this script to your PixInsight list of scripts, which will then appear under the menu Script -> Utilities -> dnaLinearFit. It is extremely simple to use. Simply select one of your mosaic segment images as Reference View and set Target View to each of your other mosaic segment images, one by one (with the default setting of Mean / Median under LinearFit Method​). ​You will notice your mosaic segment images changing brightness once the script is applied to them. You will have to re-apply the autostretch to see them properly. This script will have done the job of Frame adaptation, despite your inability to use this earlier with StarAlignment. In fact, I have sometimes found it to do an even better job, so it is well worth using. Once done, save your registered mosaic segment images so these changes are saved. Remember, you need all of these to be saved as individual image files for use with GradientMergeMosaic​ in the next section. ​We now come to the last step - creating a seamless mosaic. This is done with the GradientMergeMosaic​ process, which we now open. All we simply need to do is click the Add Files button and add all our individual images (that we saved in the previous section) to the list. I called mine 1.fit and 2.fit​. You may have more images. Remember that these images are the ones registered with the rough mosaic​ (or the fake stars image) that have black filling in them. The order in this list actually does matter and the more images you have in your mosaic, the more the list order matters. It only matters in terms of distortions introduced by merging them into a mosaic. If you have bright stars on the edges where images merge, they could appear distorted. Also, you may get better results by overlaying the second image over the first, rather than vice versa, for example. It helps to know which image number corresponds to which segment of your mosaic, so that if you identify distortions, that you can reverse the order of at least two images on this list. To do so, simply select one and click the Move Up or Move Down buttons. Images are overlaid on top of one another top-down, so in my case above, my second image (2.fit) overlays on top of the first image (1.fit​) where they intersect. To proceed with the merge, select Overlay under Type of combination. We should test and see what our mosaic image looks like with default settings. We will discuss Shrink radius and Feather radius​ in a bit. To run the process, simply click the Apply Global​ button on it. ​The above result looks very good and pretty seamless. If you find that you are still seeing seams in your images, you can try increasing Feather radius above 10. However, if GradientMergeMosaic is failing to produce the mosaic image due to registration problems, you can reduce Feather radius (or back it down from where you set it). A value of 20 for Feather radius may work better for you, depending on results achieved at default settings. At times, merging into a mosaic can also pinch stars at the borders, particularly if they are bright. For example, at default settings I have a pinched​ star in my mosaic image. Clearly this has removed the issue of the pinched star. Increasing Feather radius further also produces better seams between the images. Keep in mind that different imaging conditions as well as a different number of images stacked can yield a slight difference in background between images in a mosaic and may appear as if there is a slight change going from one segment to the next. This is unavoidable to some extent, but is somewhat treatable in post-processing as you bring up the contrast and apply noise reduction mostly to the background (over the entire mosaic image). At this point you may very well be happy with your mosaic image, but what if increasing Shrink radius does not remove a particularly persistent pinched star? This is treatable with PixelMath. Essentially the issue lies in that both images have this bright star near the edge where the images merge. You may be able to fix this by reversing the order of the images in GradientMergeMosaic, though that may make things worse by introducing more pinched stars! You may also fix it by essentially deleting the problematic star from one of the images (usually the one that is above on the overlay - in my case, the second image, corresponding to the top segment and called 2.fit). ​To do this, we open the image we want to modify and autostretch it so we can see what we are working with. Below I have opted to open my first image, the bottom segment, called 1.fit​. A better idea would be to modify the image that goes on top, just in case you overdo the deletion​, the image below makes up for any lost pixels​. ​We will need to first identify the coordinate boundaries of this star, which we replace into x_low, x_high, y_low and y_high​ in the above. For this, simply click on the image and keep your left mouse button pressed to bring up the Readout Mode preview. Hover your mouse pointer slightly to the top-left of the star, as shown. x and y coordinates are shown here. Above, I have rounded down ​the values on purpose. Now hover your mouse pointer slightly to the bottom-right of the star, as shown. New x and y coordinates will be shown here. If you get some black lines around your previously problematic star, it means you deleted too many pixels around the problematic star. Either go back and delete a few less pixels or make sure you delete the star from the image that is overlaid on top (in my case, my second image, 2.fit). 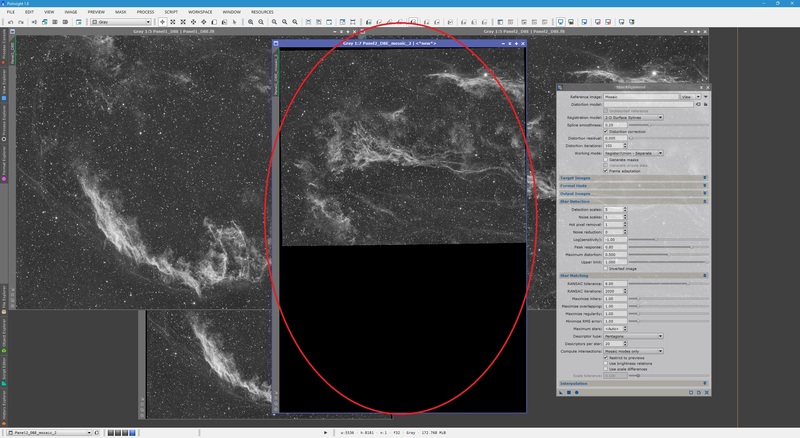 With the mosaic image generated seamlessly and without problematic stars, we now crop out the black edges created during the mosaic construction process. For this, we use the DynamicCrop​ process. Simply open the process and click its Reset button to initialise it. Now just drag the four sides of the highlighted area inwards to exclude the black edges completely. You may want to zoom out one step in order to see the boundaries clearly. Once you have a rough crop selected, zoom in and check each side carefully to make sure you are not cropping out too much (or too little and leaving a black edge!). Once you are happy, click the Execute button and close the DynamicCrop process. Below shows my resulting mosaic image after the crop and after a quick 90° clockwise rotation using FastRotation​. Please note that the above mosaic image is still linear. Nothing has been done to it, officially. It still requires the regular regime of noise reduction, non-linear stretching, contrast enhancement, etc. The idea is that you pre-process all your individual mosaic segment images, remove any black edges from pre-processing, remove any background gradients and then produce a mosaic out of them. Once the mosaic is created, you can continue with post-processing as you usually would with a single image. Keep in mind that if you image in monochrome and therefore having several mosaic segments captured through several filters, you will need to repeat the above process for each and every filter image first. Once done, you can use the StarAlignment process to register them all together with one of them as reference. Once done, you can use the LinearFit process to match the brightness between each filter image and then you may colour-combine and perform your usual post-processing.